Casa Olea is a small residence made of 4 apartments for a number from 2 to 6 persons. Every room of the house has view on the lake and each apartment exits on the garden separated one to the other by a jasmine hedge. There is a lift that brings guests from the underground garage to the house level. The swimming pool (12 x 3,5 mts) is fitted with sunchairs and shower. 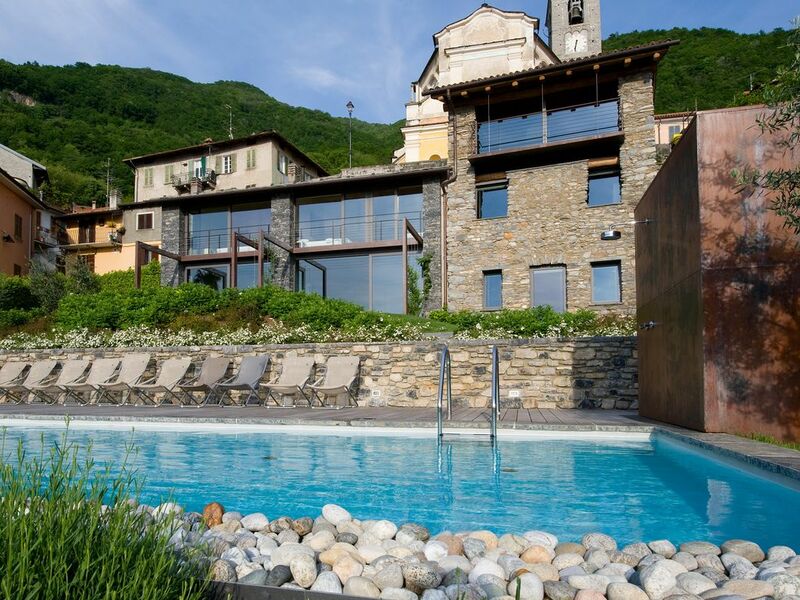 The main attraction of Olea House is its stunning 180 degree view of Lake Como. The house is a superb example of a restoration which is sympathetic to its surroundings. The former farmhouse blends traditional Italian style with contemporary features. The original stone structure has been retained and stone and wood are still the main components. The interior is both modern and functional. The garden, disturbed only by birdsong and hourly church bells, is a haven of tranquillity and relaxation; the private swimming pool as well as the nearby tennis and basket ball court will ensure your complete enjoyment. Everything is designed for the guests to feel comfortable and to make their holiday on Lake Como unforgettable. The house is located in the small village of Perledo, 2 miles drive from Varenna and 50 feet up a hill. Casa Olea takes its name from the 300 olive trees belonging to the property and every November there is an olive picking festival. There is a lift that brings guests from the underground garage to the house level. The apartment is amazing! The view is stunning! There is a great bar around the corner great for coffee! Use Rita for the taxi service she is very informative. If you take the ferry to como make sure to check when they stop for the day. Learned the hard way and has to spend money to get a taxi. Varenna is a beautiful town great food! Loved it! Will be back! We really enjoyed our stay here. The apartment was very clean and romantic with great views. Perledo doesn’t have much, but it is not far from Varenna and the Wayfarer’s Trail (great hike). Hope to return someday! We strayed in the RED apartment and the view from the balcony and the unit was stunning. The apartment is clean and simply furnished with lovely natural materials (Stone and exposed wood beams). The kitchen is basic, but has what you need. Be sure to bring you groceries as there are not shops/restaurants nearby. You will need a car to make your way back to Varenna (via curvy mountain roads) for dinners. If you just want to relax and soak in the view, this is your place. We also wandered the streets and found the MOBILE market (food truck with groceries) which was fun. So peaceful and beautiful. The church bells (right above you) are memorable and charming as well. Great place! Großartige Lage, wundervoller Blick auf den Comer See, sehr gepflegte Anlage. Super Appartement. Wer tolle Architektur mit viel Glas und allen Vor- und Nachteilen liebt, wird sich sehr wohlfühlen. Super Lage direkt im Ortskern von Perledo und an den Wanderwegen. Rita Faggi (338-855-4687)the cab driver took great care of us. Thanks to Casa Olea central position on Lake of Como you can easily visit the most attractive places on the lake. old villas, typical villages like Bellagio, Menaggio, Gravedona and many others and reach the different beaches on the lake coast. In 10' you can take a train that brings you to Milano, Bergamo, Como in not more than an hour time. Other places you can reach in 1h drive are: Lugano, St. Moritz, different Alps best sites as Passo dello Spluga., Passo San Marco. From Casa Olea you can take old stone walking paths that bring you to the villages of Vezio Castle, Gisazio, Bologna in the nature with breathtaking view sites. In half an hour drive you can take the path that brings you to the top of Grigna mountain (2400 mts.). A guide is recommended. You can find any kind of attraction as sport activities: wind surfing, swimming, trekking; historical guided visits and shopping in towns.